A fudge recipe with minimal ingredients and maximum taste! 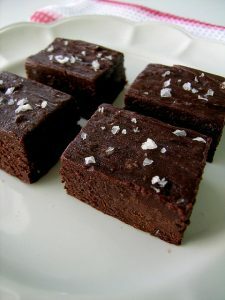 This quick fudge recipe makes it easy to whip up a dessert that is both delicious and guilt-free. Coconut oil strengthens the immune system, and can reduce the viral susceptibility for cancer patients. It also boosts brain function and improves blood cholesterol levels. Just make sure you select an organic, virgin coconut oil in order to enjoy the benefits! Cacao powder has four times the antioxidant content of regular dark chocolate, including flavanols that protect the body against cardiovascular disease, improve blood circulation, and reduce the risk of stroke. Finally, a rich dessert that will leave your palette and your body satisfied! 1. Line an 8×8-inch square tin with parchment paper and set aside. 2. Place all ingredients together in the bowl of a food processor and process until well combined and the mixture comes together to form a ball. 3. Press evenly into the bottom of the tin and place in the refrigerator 30 minutes to 1 hour to harden. 4. Using cookie cutters, cut into desired shapes. Store in fridge. Tip: Add crushed sea salt to the tops for added texture and flavor.